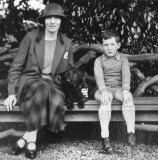 Jan and Cora Gordon were friends of Doris and Ashley Smith in the years during and following the First World War. The book "Modern French Painters" was dedicated to Doris and Ashley ( https://pbase.com/hajar/image/143568686 ), and their children and home appear in a number of works of art ( see https://pbase.com/hajar/jan_and_cora_gordon_in_england ). Doris Ives Smith (1888-1951) was a writer, using the name Catherine Ives. In addition to many magazine articles she wrote two well-known cookery books. "When The Cook Is Away", published in 1928, was ".. intended to come to the rescue of people whose kitchens have been deprived of their cooks and who know nothing about cooking themselves." The original design for the book cover, by Cecil Beaton, was auctioned in 2006. "Good Meals For Hard Times" was published in 1940, with an emphasis on economy and cheerfulness. She wrote, "Some of the dishes which are still favourites in my own household made their first appearance there during the last war." Rationing had just begun and she wrote "no one knows yet how many foodstuffs may have to be rationed or what the amount of those rations may be." Doris may have taken inspiration for her future books from times spent with the Gordons at the cottage in Itchenor. For example, in Jan Gordon's diary for 1917 (copy shared with W.D.A. Smith by K Bryant) is the following: “Jo has been for several days immersed in a book called Home cookery in Wartime, by a man named Oldmeadows. He is a queer character and keeps a wine shop opposite the Rendez-Vous. Ashley knows him quite well. The book is excellently written and most amusing. He is greatly satirical about English cooking, and makes this book (so Jo says) as interesting as a novel, he makes cooking seem exciting." Doris came from a famous line of mining engineers, including the great Westgarth Forster (1772-1835) who wrote "A Treatise on a Section of the Strata from Newcastle-upon-Tyne to the Mountain of Cross Fell in Cumberland." ( see https://pbase.com/hajar/british_minerals ). Her father, Thomas Forster Brown, and brothers Westgarth and Edward Otto were also mining engineers. Her father was born in Garrigill and died at Richmond, Yorkshire, on October 23, 1907, at the age of seventy-three, a year before his daughter met her future husband Ashley Smith (my grandfather). According to Ashley, Doris told him that “had we met we should have had one blazing row and then become the best of friends. I think she was right from all that I have heard about him.” I suspect that there could have been some of the traditional northern suspicion of a southerner involved had such a meeting ever happened.. I was interested in the name of Catherine Ives that was featured on a postcard I purchased today, but after googling the name discovered that it was a non deplume for Doris Ives Smith & later information that the surname of Ives is not mentioned again . I am a granddaughter of one Charles Fredrick Ives of London England . Would there be any connection at all? In appreciation for any information at all, as an English cousin is in the process of compiling an Ives Family Tree Thank you .